I first read Central Station last year (you can find my original review here) and, at the time, I said that I wouldn’t be surprised if it ended up being shortlisted by several awards. As it sometimes happens, I was right and I decided to read it again as a part of this particular project. The first time I read it, I thought it was a brilliant book in its ideas but I didn’t actually especially enjoy reading it, my experience was a bit different the second time around but still, I don’t think Central Station is fully a book for me. It’s full of interesting ideas, the writing is gorgeous but, for some reasons, I couldn’t immerse myself in the stories. 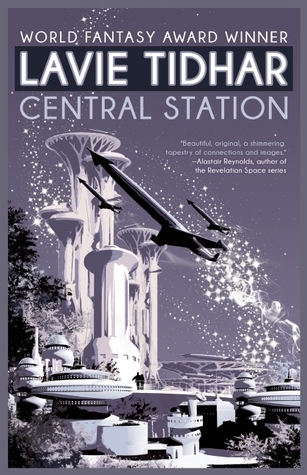 Central Station is a fix-up novel, it is a collection of interconnected short stories that were almost all previously published in several SF magazines (mostly Interzone). Throughout those stories, we follow the lives of several people living in Central Station, a space station set in a future Tel Aviv. Everything and everything can be found in Central Station, to cyborgs, data-vampires, genetically modified children or god designers. Since the stories are connected, the same characters kept on popping up in different ways and that’s the main thing that didn’t work for me. Indeed, the stories were all published separately and they don’t all have the same atmosphere or tone. Oddly, seeing the same characters through very different lights threw me off the stories a bit because some of their behavior didn’t seem on phase with how they were in other stories. However, I havent’ seen this particular thing mentionned in other reviews so, it might just be me interpreting things too much. Also, since the stories tended to have very different tones, this collection felt messy because it lacked cohesio. Indeed, some stories are very fantastical and other are way more science fiction-heavy and, as a whole it felt a bit awkward. I also had troubles connecting to most of the characters,they are all very flawed and since the characters I disliked the most were the ones that were appearing the most in this collection, it was hard for me to care for the stories, especially towards the end. However, the main protagonist of the stories aren’t really the characters per say but Central Station as a whole. I liked the fact that it felt incredibly vivid and almost “touchable”. Everything is described in a gorgeous way, you can almost smell the streets, see and hear the inhabitants of Central Station, it feels real and the way Tidhar describes its history is beautiful. I would have read a novel in the city’s POV with pleasure actually since it felt way more developped than the actual characters. So, as much as I didn’t fall in love with Central Station, it is a very clever work of science fiction, it is a vrey interesting reflexion on humanity and evolution. Central Station is a hub, a perpetual clash of cultures. It’s a place where you can eat shawarmas on the street, go to a Robot Church or take the next spaceship to Mars. It is both the future and the past, it’s about humans through times and their different stages of cyber evolution. It is an ode to older science fiction books and I would recommend it to everyone interested by intelligent and fascinating fiction even if I had issues with it. At this point I have read all the shortlisted books and Central Station is, in my opinion, a very strong contender for the prize. June is finally over which means that I’m done with school for a few months yay! I fully intend to read and post a lot during my free time. I still managed to read a couple of things this month, they were mostly short but for the most part very good books. I read two things in French which was a bit weird because for the past two years, I have read almost everything in English but that’s a nice change. I will have a review for After Atlas coming probably early next week since I read it as part of my 2017 Clarke Project. I really enjoy this personal challenge but reviewing tthose books is very long since I take a lot of notes and putting them in order is not necessarily an easy feat, that’s why I haven’t been writing a lot of reviews lately. I probably won’t be catching up on any other reviews. I really liked I, Robot by Asimov, it was my first Asimov book and it was absolutely brilliant, it was fascinating to see a book published in the 50’s still managed to be so relevant to our present days. Tricked by Kevin Hearne is the fourth installment in his Iron Druid Chronicles series and it was a nice popcorn read, I can’t say it was particularly memorable but I read it during the last week of my exams and it was exactly what I was looking for at the time! I already finished one book this month and it is Central Station by Lavie Tidhar, it was a re-read and I will have a review up next week. I am currently halfway through Beloved by Toni Morrison and A Conjuring of Light by V.E. Schwab, and so far Beloved is a very hard but excellent read and A Conjuring of Light is boring as hell, I will finish it because I want to finish a couple of series this year but ugh, so far it’s not good. I also want to read The Prey of Gods by Nicky Drayden that I didn’t manage to read last month and I will probably also pick up One Hundred Years of Solitude by Gabriel Garcia Marquez. 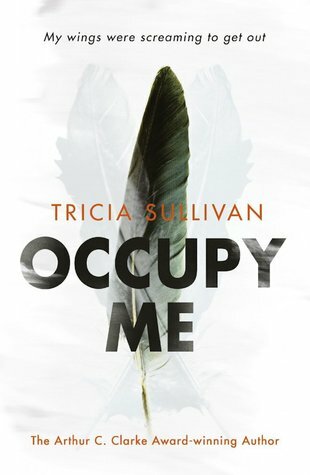 Occupy Me is the only book on the shortlist I never heard of before its nominations, however Tricia Sullivan is not a Clarke newbie since she actually won one in 1999 with her novel Dreaming in Smoke. I’m always willing to read works I never heard of before but when I glanced at the synopsis, I was a bit baffled and rightly so since this book is very hard to explain. It would be easy for me to say that this book is completely WTF and I mean, it kind of is. However, so far it seems to be the most unique book on the shortlist and, even if it is pretty messy, this book is loaded with interesting and original things (unlike you A Closed and Common Orbit!). Reading Occupy Me was quite the experience and I’m not sure I would recommend the journey, I personally enjoyed it but I expect most people to be completely thrown off or annoyed by this one. However, even if Occupy Me was a weird one, I still think it is full of very interesting points of discussion. Indeed, Sullivan brings up a lot the idea of a conflict between the new and the old like science versus fantasy and the past versus the present. The main protagonist being a perfect example of that, Pearl is a two years old quantum angel who looks like a 50 years old 6 feet tall very muscular woman, she’s both extremely young and old since she has the knowledge of an ancient being while often acting like a baby. She’s both a fantastical creature and an extremely advanced piece of tech. She’s so advanced that she can access Higher Dimension (refered to as HD in the book) which seems to be our idea of Paradise. In a way she is an organic data center and further in the book we learn that she transports dead civilizations on her body. She is a ship connecting the future and the past. Kisi Sorle, the doctor is also a good illustration of that, he grew up in a country which was destroyed by oil companies and while he wants to help his former nation, he can’t do that without the support of the ones who destroyed it to begin with. Because of that, he always feels torned between his enemies and what he wants to restore, a division represented by the being who possess him. This book reminded me quite a bit of The Book of Phoenix, a book shortlisted for the 2016 Clarke, the stories are very different but they have overlapping themes and in distinct ways, they are both angry works shouting at a society based on conflict and dichotomy. In the end, Occupy Me worked for me, it’s a very strange book and I can’t say that I understood it (I think I would have to re-read it at least once for that) but it made me think and it was far from everything I previously read. I wouldn’t be mad if it managed to win the 2017 Clarke even if it would surprise me a bit since I don’t think it’s one of the strongest contender. I have read the entire shortlist by now (I am currently re-reading Central Station) and for me the winner will either be Ninefox Gambit, The Underground Railroad or Central Station, but who knows? I don’t know what the judges think of the shortlist infortunately! Anyway, if Occupy sounds like something you might like, give it a try, it might surprise you a lot!